The Dead must stay buried.Karthia is nothing like it used to be. The kingdom's borders are open for the first time in nearly three hundred years, and raising the dead has been outlawed. Odessa is determined to explore the world beyond Karthia's waters, hoping to heal a heart broken in more ways than she can count. But with Meredy joining the ocean voyage, vanquishing her sorrow will be a difficult task.Despite the daily reminder of the history they share, Odessa and Meredy are fascinated when their journey takes them to a land where the Dead rule the night and dragons roam the streets. Odessa can't help being mesmerized by the new magic--and by the girl at her side. But just as she and Meredy are beginning to explore the new world, a terrifying development in Karthia summons them home at once.Growing political unrest on top of threats from foreign invaders means Odessa and Meredy are thrust back into the lives they tried to leave behind while specters from their past haunt their tenuous relationship. Gathering a force big enough to ward off enemies seems impossible, until one of Queen Valoria's mages creates a weapon that could make them invincible. As danger continues to mount inside the palace, Odessa fears that without the Dead, even the greatest invention won't be enough to save their fates.In this enthralling, heartrending sequel to Reign of the Fallen, Odessa faces the fight of her life as the boundaries between the Dead and the living are challenged in a way more gruesome than ever before. My Goodreads/Blog review will be put up closer to the release date as per the publishers arc preferences!Some quick thoughts:This was the perfect ending to this duology but I also think there's so much room for another book (or more!) and I SO hope that can be the case. I love the characters so much, and the sapphic angst truly kept me going. I also appreciated the nuanced look at trauma and relationships throughout this duologyI think a lot of people are going to really love this ! #1 Reign of the Fallen ★★★★★#2 Song of the Dead ★★★★★That was absolutely wonderful. It felt so good to be back in the world of Karthia with Odessa and the rest, and I honestly didn't want it to end. ♥ Review coming soon! This review can also be found on my blog! Thank you to Razorbill for providing an ARC in exchange for an honest review!3.5/5First, I want to give a huge thank you to Sarah Glenn Marsh. She’s a wonderful woman and is so sweet. I started talking to her (more like gushing about the characters from Reign of the Fallen) and she helped me receive this copy. So, a huge thank you to her. She’s just so damn sweet.This book picks up where Reign of the Fallen ends, so I’m going to do my best not to give sp This review can also be found on my blog! Thank you to Razorbill for providing an ARC in exchange for an honest review!3.5/5First, I want to give a huge thank you to Sarah Glenn Marsh. She’s a wonderful woman and is so sweet. I started talking to her (more like gushing about the characters from Reign of the Fallen) and she helped me receive this copy. So, a huge thank you to her. She’s just so damn sweet.This book picks up where Reign of the Fallen ends, so I’m going to do my best not to give spoilers for it.There’s a new cast of characters in this and there’s more worldbuilding because, for a third of the book, you get to see the larger world outside of Karthia. I really loved that. I loved the deepening mythology of the series because it makes it a good set up for future books set in the same world. This series is only a duology, so this is the last book with this cast of characters.Another thing I loved, like I did with the first book, is the diversity. In this, there are a couple of bi characters, a couple F/F couples, and a M/M couple. It’s fantastic because the diversity is just there. It never felt forced or like Marsh was trying to make it diverse to make readers happy.But, I do (obviously) have some cons for the book. While the broadening mythos of this world was wonderful, it also left me wanting more because the new things were just mentioned and they weren’t fully expanded on.I also still am not for the main romance between Odessa and Meredy. I don’t know why, but I love them as friends but not in a relationship. I loved Odessa and Evander (oh, Evander my sweet cinnamon roll) but something in me just can’t connect with Meredy and Odessa.The plot, I feel, also was rushed. In a way, it felt like so many things were being jammed into the book. The mythos around powers, the new parts of this world, the budding and changing relationship between Odessa and Meredy, the plot to get rid of Valoria, introducing a bunch of new characters. There was just so much going on that it was hard to keep it cohesive since there was just so much to keep track of for me as a reader.I did enjoy this book. I’m so sad that this is the last of it, but I’m also so glad that Marsh is going to keep this a duology since it seems like those are disappearing. It also makes me excited for extra books in this world, but not featuring the same characters or having them there but just as little inserts for old readers.Overall, I have critiques of the book but it was still a joy to read and I can’t wait to have a finished copy so I can binge read the whole series. I loved Song of the Dead just as much as Reign of the Fallen. There may be spoilers for book one in this review.Warnings for addiction and violence. I really fell in love with the characters when reading Reign of the Fallen. I was happy to see them back for book two and we got some new characters that I really liked, too.Odessa is my favorite. I love that she's so flawed, but she realizes it and tries so hard to get better. She loves with her whole heart, plus she's a total badass. In So I loved Song of the Dead just as much as Reign of the Fallen. There may be spoilers for book one in this review.Warnings for addiction and violence. I really fell in love with the characters when reading Reign of the Fallen. I was happy to see them back for book two and we got some new characters that I really liked, too.Odessa is my favorite. I love that she's so flawed, but she realizes it and tries so hard to get better. She loves with her whole heart, plus she's a total badass. In Song of the Dead, Odessa is still dealing with the loss of Evander, plus her addiction issues. She may be done with the potion, but she still thinks about it. Odessa is also trying to figure out her feelings for Meredy, while still loving Evander. Valoria has forbidden the raising of the dead, so the necromancers feel a bit lost. They do find out that they are still very much needed though. "I'm Odessa of Grenwyr, and the dead answer to me. "The book starts out where book one left off. Odessa and Meredy are on Kasmira's ship. They go to a couple different places before hearing of issues with Valoria. They do meet a girl, Azelie, and Odessa gets a pet dragon, Nipper. Azelie is such a great addition to the group and I freaking love Nipper. I would read a whole book just about her and the other dragons. When they hear that Valoria was attacked by a shade and that many of her own people are rebelling against her, Odessa, Meredy, and Kasmira head back to help. Everyone is pretty upset with Odessa for leaving without saying goodbye. Jax has been drinking a lot. Danial and Simeon are planning a wedding. Valoria has been creating new things that many people are against. And there are new kids in a school working on their powers. Karston is a new character that we see a lot of. He is a lot like Jax and Odessa can't help but like him. There is a lot of action throughout the book. The group wants to figure out who is trying to hurt Valoria while also preparing for boats from another land that are said to be hostile. They are training to fight. Odessa also bought this stone from a vendor that is said to let you speak to the dead. She uses it and then shares with Meredy. Meredy becomes addicted to it, which causes a lot of problems with their relationship. There is also a lot of death. Lysander is back and I love his interactions with Nipper. There's just so much to love about this book and I don't want to ruin anything for anyone.I gave this book 5 stars. Thank you to Penguin Teen for sending me a physical arc for review. I already have my finished copy ordered and can't wait to see the beautiful, finished cover in person. We have a cover and it is beautiful! I really liked the first book, so I am hoping this one is going to be great as well! Yet another gorgeous fantasy from Sarah Glenn Marsh. ***ARC received from publisher in exchange for an honest review***I seriously love Sarah's writing. The flow of the book is wonderful and I'm never confused about what is going on.I fell in love with Reign of the Fallen as soon as I started reading it. I quickly started stalking, I mean following, Sarah on social media and bugging her enough that she became my friend ;) As soon as I finished Reign, I NEEDED the next part of the story! I love the characters and the magic in this world.I love the ***ARC received from publisher in exchange for an honest review***I seriously love Sarah's writing. The flow of the book is wonderful and I'm never confused about what is going on.I fell in love with Reign of the Fallen as soon as I started reading it. I quickly started stalking, I mean following, Sarah on social media and bugging her enough that she became my friend ;) As soon as I finished Reign, I NEEDED the next part of the story! I love the characters and the magic in this world.I love the fact that this book touches on everyday issues that people face. Grief, love, addiction, friendship. The dynamics of the friends in Song of the Dead is wonderful and you truly feel like they love each other. The romance in this book is nice, there are some really sweet couples! I was almost worried that the main romance would be overbearing and take over the plot, but it ended up working in nicely. I do have to admit that I was more invested in the side characters love lives though.I am quite obsessed with the magic in this world, as I said before. I find it so interesting that the magical abilities you have are linked to eye color! So fun! Also - the animal familiars are my fav! :)This book took a completely different path than I thought it would. It went a little darker towards the end, and I was definitely shocked and a little sad about certain events. Sarah knows how to pull the heart strings, that's for sure. I really think it ended just how it needed to though. The book could have handled just a LITTLE more heartache, but that's all I'll say!I really want more from this world! Even if it's just a novella or a companion novel. There are so many characters that Sarah could focus on and run with their stories! I really hope this isn't the last of the Necromancers I've come to love. And I need more Nipper in my life! I am incredibly excited for the cover reveal of this book! I was able to go to Sarah's event at One More Page, Arlington, VA, and she is not only an inspiring person but an inspiring author. Not to mention, look at this cover! It is gorgeous! COVER!The first book was a three star read but I really want to know where the story will go next. I already know this book is going to be magical. 3.75I received this as an advance copy from Penguin Teen and it was really good. The book picks up where it left off from Reign and while it seemed confusing and unnecessary at first, it all comes into play as the book goes on. While I’m not a fan of romance, the love in this book is so heart warming if not sickly sweet at some points. It’s hard not to “aww” at a few moments. Overall, I think the plot of this book was just as interesting and odd as the first one, which made me want to keep going 3.75I received this as an advance copy from Penguin Teen and it was really good. The book picks up where it left off from Reign and while it seemed confusing and unnecessary at first, it all comes into play as the book goes on. While I’m not a fan of romance, the love in this book is so heart warming if not sickly sweet at some points. It’s hard not to “aww” at a few moments. Overall, I think the plot of this book was just as interesting and odd as the first one, which made me want to keep going, even if I wasn’t sure where it was going at first. If you liked Reign of the Fallen, you’ll love Song of the Dead - even if it’s more focused on the living! Simply amazing and a great continuation after Reign of the Fallen. Full review to come!Thank you to Penguin Teen for an advanced copy. All thoughts are my own. This review is spoiler free.I want to give a very special thanks to my friend Sarah for allowing me to read this book early because I could not contain my excitement!AND I STILL CAN’T!Okay, so we are pretty much where we left off. Odessa and Meredy are on the ship together and plan to explore the world just like Evander would have. Of course, things go wrong. Trouble is brewing in Karthia with people protesting Valoria’s power and her current plans for the kingdom. A deadly disease is slowly spr This review is spoiler free.I want to give a very special thanks to my friend Sarah for allowing me to read this book early because I could not contain my excitement!AND I STILL CAN’T!Okay, so we are pretty much where we left off. Odessa and Meredy are on the ship together and plan to explore the world just like Evander would have. Of course, things go wrong. Trouble is brewing in Karthia with people protesting Valoria’s power and her current plans for the kingdom. A deadly disease is slowly spreading. New discoveries are made.It’s just a lot.I really loved going back into Odessa’s mind. I truly missed this character and I was so fascinated and in love with her emotional turmoil. She is still reeling from the death of Evander while also battling her growing feelings for Meredy.BI REP FTW!Excuse me. Sorry. Had to get that out there.When the ship lands on an island, we discover that there are dragons roaming about and Odessa even “accidentally” adopts one named Nipper! You’ll fall in love with this one immediately. I wish I had a Nipper of my own…if reality was like that.We meet new characters in this book too. There’s Karston, who is fascinated by the stories he has heard of Odessa and aspires to do great things. There’s Azelie, who has a strong passion for plants and flowers and the beauty of the Earth in general.Can I call an inanimate object a character? Let’s just say that there is this…magical thing…that I didn’t trust from the beginning. You shouldn’t trust it, either. I know an explanation for this thing was given and how it worked, but I do kind of wish something bigger was behind it. But hey, I didn’t write the book!This final (yes, it’s a duology sadly) installment is packed with action and, if you were a fan of the first book, you will not be disappointed.Story time: I was reading a very suspenseful and intense scene. I was so engrossed with the book that I didn’t realize the tingling sensation on my foot. It turns out a cricket jumped on my bare foot. That’s not something you want to experience when reading that kind of scene. Talk about heart stopping.I’m so proud of Sarah and I’m so sad that this series is over.Unless Penguin Teen decides they want more. Who else votes for another or an Evander novella?HINT HINT PENGUIN TEEN!In conclusion, there is not enough that I can say about this book without breaking my fingers off while typing. I’m so happy and grateful that I got to read this super early because I can confidently tell you that Odessa has earned her spot in my heart when it comes to my favorite badass characters. THE COVER IS MATCHING AND BLUE AND HAS A BIRD THAT IS MY TRIFECTA 💙🦅😍😍😍WE HAVE TITLE AND BLURB.color me excited. Reign of the Fallen - 96%Song of the Dead - ?Series score - ? Karthia is almost unrecognizable. Change is allowed, people can travel, science can move forward. Valoria, the newly crowned queen, is met with resistance from subjects used to being ruled by a king that forbids any change at all. Odessa, master necromancer with no job anymore with the laws against resurrecting the dead, chooses to leave without a word and travel with her friend Kasmira and Meredy, the girl she has feelings for. She wants to see the world and experience something untouched by he Karthia is almost unrecognizable. Change is allowed, people can travel, science can move forward. Valoria, the newly crowned queen, is met with resistance from subjects used to being ruled by a king that forbids any change at all. Odessa, master necromancer with no job anymore with the laws against resurrecting the dead, chooses to leave without a word and travel with her friend Kasmira and Meredy, the girl she has feelings for. She wants to see the world and experience something untouched by her grief and the events that led to Valoria's reign. Unfortunately, now that Karthia is in contact with the world, the world is more aware of Karthia and the weakness of the current reign. Odessa goes back to serve her queen and hopes it isn't too late.Song of the Dead is the sequel to Reign of the Fallen in which the world has a few different types of magic particular to certain eye colors. This installment expands the world from Karthia and shows how unaware of the rest of the world they were. Other lands ban necromacers altogether while other lands breed dragons and still others travel around, pillaging and stealing along the way. There are marvels and dangers Karthia was completely unaware of, which is creating issues for them now. Different abilities are also shown with people of unique eyecolors than the usual such as power over plants, shapeshifting, and a different type of necromancy. The young adults with these unique powers were forced to hide them due to the shame and mistreatment of those around them. Since they are viewed outside the norm, it feels akin to LGBT or nonbinary or those with different beliefs than their intolerant parents are treated. The main conflict of the novel comes from people attacking Karthia from the inside, their own subjects resistent to change, and those outside, possibly trying to conquer or take their resources. The internal conflict is populated by very different people, violent and peaceful alike. Although she is constantly in danger from terrorist attacks, Valoria still tries to debate and negoatiate with the group in order to work towards peace. She is a powerhouse ruler who does what's needed sometimes at the expense of herself. The outward conflict is dealt with brilliantly because it shows how rumors and offensive stereotypes can spread and affect how people in far lands can view them. I wish these issues had come up sooner. While I like the romance between Meredy and Odessa, I felt it the conflict and angst around it took up too much time and made the ending feel quite rushed. I did, however, appreciate that Odessa was able to put her romantic troubles aside when more important things need her attention.The undead are not seen much in this installment, much to my disappointment, but there are new ways for the dead to enter the mortal realm. One specific zombie proves to be much more dangerous than he seems and makes up for the lack of undead everywhere else. This aspect surprised me and came out of nowhere. I hope further installments have more zombies, but not if Valoria still bans the resurrection of the dead. I found these particular zombies fascinating with their urge to eat but never becoming satiated and their transformation to shades if the living see any part of them. Their absence in Karthia leaves a hole in their society that people miss. Many aren't used to not spending time with dead loved ones. There was no need to mourn or miss them. Life went on as usual with generations of relatives around. Now, the living remain with new people holding power in families, another aspect of change that's widely hated. Song of the Dead is enjoyable and widens the scope of the world, revealing modern marvels and unknown dangers. The pacing is a little off and the relationship between Meredy and Odessa (with their dramatic breakups and makeups) took more precedence in terms of time. I also felt that Meredy's struggles with addiction mirrored Odessa's too much and Odessa's response to some of Meredy's behavior felt off to me. Other than that, the novel is a worthy continuation and has me eager for more (hopefully with more zombies). I made no secret of my love for REIGN OF THE FALLEN and I had high hopes for this beautiful sequel and it delivered on every level. Even if you haven’t read the first book, you should. Like, now. But as a standalone, this book is soooooo good. There is magic, strong girls, and distant lands. You will have a crush on Odessa when you finish this book. And Meredy. And a particular dragon. :) Sarah Glenn Marsh delivers a powerful punch with this fantasy novel, taking the reader to gorgeous shores an I made no secret of my love for REIGN OF THE FALLEN and I had high hopes for this beautiful sequel and it delivered on every level. Even if you haven’t read the first book, you should. Like, now. But as a standalone, this book is soooooo good. There is magic, strong girls, and distant lands. You will have a crush on Odessa when you finish this book. And Meredy. And a particular dragon. :) Sarah Glenn Marsh delivers a powerful punch with this fantasy novel, taking the reader to gorgeous shores and treacherous homelands. I loved every minute I spent in this story and I’d like a memory potion (please and thank you) to wipe my recollection of reading Song of the Dead so I could have the pleasure of living in its pages for the first time once again. ALSO, THAT COVER!!!!!!!!!!!!!! (Disclaimer: I received this free book from the publisher. This has not impacted my review which is unbiased and honest. )It feels so good to be with my favorites again. I've missed my precious necromancers, queens, and healers so much. But they're not out of the woods. Because what happens after will be a story of rebellion, new countries, dragons, and romance. There's something for all the pieces of your heart (that you'll have to pick up once the book is done and the weight of the duology bein (Disclaimer: I received this free book from the publisher. This has not impacted my review which is unbiased and honest. )It feels so good to be with my favorites again. I've missed my precious necromancers, queens, and healers so much. But they're not out of the woods. Because what happens after will be a story of rebellion, new countries, dragons, and romance. There's something for all the pieces of your heart (that you'll have to pick up once the book is done and the weight of the duology being done hits you). Marsh takes everything you loved about Reign of the Fallen, expands on the world and explores new themes. Get ready. 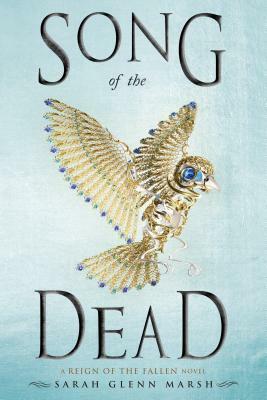 I jumped at the chance to read an advance copy of Song of the Dead because after finishing Reign of the Fallen, I had to know what happens next! Sarah Glenn Marsh's breathtaking, unique world-building and detailed plotting make this book an instant favorite. I loved not just the main characters, but everyone in Odessa's circle of friends, especially Valoria, a ruler who's willing to make tough decisions for the good of her kingdom. I loved this book! It was a great sequel to Reign of the Fallen. Let me tell you, Odessa is a much better human being than I am. This book will make you cry so many times, but it'll be worth it!